As a US translator, you can rely on more linguistic familiarity with Spanish: lately, I’ve been grappling with a language that mixes fake ye olde Catalan with Venezuelan Spanish slang and I can look to Spanglish to recreate that in English. I learned Spanish long before I learned Catalan and for years I was significantly more confident in it, but that’s not really the case anymore, though it is still ever so slightly more daunting to approach a Catalan original for the first time. GN: It is often said that puns (or, indeed, wordplay in general) are difficult, if not impossible, to translate. However, throughout Brother in Ice, you negotiate these issues well: “According to polar historian Fergus Fleming,” states the narrator, “the Arctic furor reached such heights that it was the subject of jokes in Europe and the United States. Was there a pole at the Pole? Was it made of wood? Did it have stripes like a barber’s pole?” Was it a convenient coincidence that the Catalan word pols is homophonous to the English word poles? And how do you normally work through issues of untranslatability? MFL: If I felt wordplay was impossible to translate I would really be in the wrong business. That’s the fun part. And the most satisfying, and the most unsatisfying, part. “Poles” was handed to me on a plate—that’s one of the perks of translating from Romance languages, that can happen. But fairly often I will swap out a joke for another one, or compensate somehow. It has to be funny if it’s funny, and logical if it’s logical; that’s more important to me than necessarily citing the same cultural reference as the original. A question I will sometimes ask of a native speaker is “does this sound normal” or “is this a common construction to hear?” Once I feel I’ve grasped the author’s intent, I’m free to take it to the next level. Puns sometimes can’t be smoothly done; they are either forced-sounding in English when they aren’t in the original, or aren’t puns anymore. But there’s probably another word close by that can be punned on in a way that’s equally funny, or poignant, or clever, or show-offy, or corny, and it all comes out in the wash. Hopefully. A bad pun is bad, because to be true to the text it should be translated for a bad, forced pun in English, but the writer inside you wants to fix it up, give that pun a second chance to be good. Luckily, this book had no bad puns. I was pleased with how the intertextuality came across. Alicia Kopf is what some people call a writer’s writer, which is to say a reader. GN: It is possible to say that the text of Brother in Ice is, to a certain extent, constructed out of many texts—some of which are originally in English and some of which are originally in Catalan. Nevertheless, most of these texts (Snow Postscripts by Ukichiro Nakaya, Letter from an Unknown Woman by Stefan Zweig, and Journey to the Center of the Earth by Jules Verne) have been written in languages other than English or Catalan, and are cited throughout Alicia Kopf’s novel in translation. Can you tell us a bit about the process that informed the decision to use one particular translation of a text (in the case of Journey to the Center of the Earth, that of Frederick Amadeus Malleson) rather than another? As for the texts written in Catalan, how did you approach their translation into English? MFL: I use Google searches to find translations, based on a rough translation of my own. If the original is in a language I can read I compare the two and sometimes disagree enough to stick with my own translation over a published version. I remember for the Stefan Zweig I got in touch with the publishers to request a PDF to make sure it was their new translation because I preferred it be in print, and I knew the translator’s reputation. For texts in Catalan not previously translated, I just translated them. In this book the research ranged from fairly accessible, for the polar explorations which are very well documented in English, to sometimes pretty obscure, like the blog of some Spanish scientist. In the latter case I had to read more entries to get the feel for his style and bring that across in the quotation. GN: The novel is described as being “part research notes, part fictionalized diary, and part travelogue.” Did any of these three sections prove more challenging to you in the process of translation? MFL: I worked from the Catalan original, and read the author’s own version in Spanish, and conferred with her, and felt close to the material of all three parts. In the end, if I had to choose what was most challenging it would be the diary part, because it was the most subjective, and the most personal, which heightens my sense of responsibility and can make the process slightly more fraught. GN: At a later point in the novel, the narrator confesses: “Now this place touching the Arctic Circle is emerging as the final point of a journey that has included several exhibitions but that is, in essence, narrative.” Translation seems to permeate Àrticantàrtic as a project, in that it moves from a visual medium to a written medium. Do you see Brother in Ice, in its conception, as an exercise in translation? MFL: Not any more than I think all artistic expression could be looked at as an exercise in translation, merely because any attempt to communicate requires translating our thoughts and feelings from an inner discussion to one meant to be understood by an outer audience. Translation as metaphor is much less interesting to me than Alicia’s metaphor of artistic creation as akin to the polar explorations, the conquest of the white, ever-shifting point, AKA the blank page. Àrticantàrtic is part of a series of very documentary exhibitions that incorporate text and “quote” extensively. The novel fleshes out that narrative and ups the ante by delving more into the personal aspects of risk taking and resilience in the search to define your artistic voice. 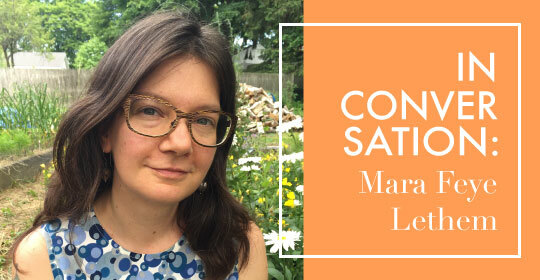 Mara Faye Lethem’s translations include novels by Jaume Cabré, David Trueba, Albert Sánchez Piñol, Javier Calvo, Patricio Pron, Marc Pastor and Toni Sala. Her translation of Sara Moliner’s The Whispering City was awarded an English PEN Award. Georgia Nasseh was born and raised in Rio de Janeiro, Brazil, where she lived until her undergraduate years at Queen Mary, University of London, where she studied English. She has an MSt in English from University of Oxford, where she is now undertaking a DPhil in Medieval and Modern Languages. Her research focuses on multilingualism and translation in Luso-African literatures, particularly in the work of José Luandino Vieira.